A Tony Doherty Production as part of the ARNOLD CLASSIC AUSTRALIA: March 18 – 20th, 2016. Plenary Hall, Melbourne Convention & Exhibition Centre, VIC. Australia. The contest saw an historic 3rd Pro victory in Australia for KAI GREENE, and his first Arnold Classic Australia title. This was the second IFBB Arnold Classic Australia event. See every round of the PREJUDGING for each class through to the routines, exciting posedown and all awards at the FINALS. The exciting 120Kg Circus Dumbbell Press from the Arnold Classic Australia Strongman event was shown on stage at the Finals. This was won by Overall Strongman winner Hafthór Björnsson from Iceland. A Wide Screen 16:9 production. Shot with 2 HD cameras at the FINALS. (*Also available on BLU-RAY - see below). 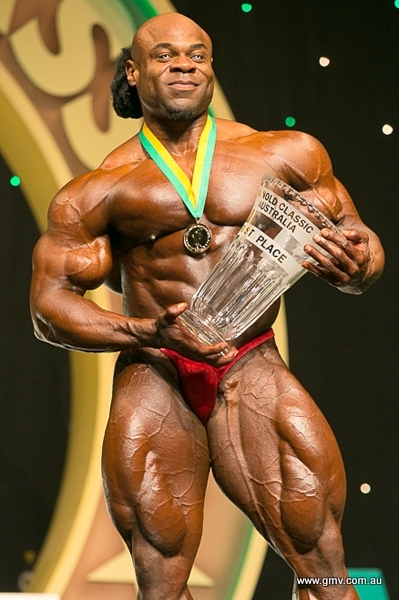 The contest saw an historic 3rd Pro victory in Australia for KAI GREENE, and his first Arnold Classic Australia title. This was the second IFBB Arnold Classic Australia event. See every round of the PREJUDGING for each class through to the routines, exciting posedown and all awards at the FINALS. INDIA PAULINO won the Arnold Classic Pro Bikini Class, OKSANA GRISHINA won the Pro Fitness Class and LATORYA WATTS won the Arnold Classic Pro Figure Class. The Men’s DVD presents all of the Bodybuilding Classes of the 2016 ARNOLD AUSTRALIA MEN’S AMATEUR. See all of the lineups, key comparisons, callouts and all awards, plus the OVERALL AWARDS presented by Arnold, plus the awarding of Pro Cards. See all of the lineups, key comparisons and callouts and all awards, plus the OVERALLS and Pro Cards for the BIKINI FITNESS won by MANUELA BASTOS of Australia and BODY FITNESS won by STACEY STEINER of Australia. Pro Cards also went to Australia’s LEE-ANNE TEMNYK in WOMEN’S PHYSIQUE and TONY GNAP in FITNESS making 4 Pro cards awarded in total. The ARNOLD MODEL SEARCH AUSTRALIA - Female Models was won by Lindsay Turner of Australia. The Complete List of Arnold Classic Australia & Australian GP Videos on DVD.